Embattled Sahara Group, on Friday, told the Supreme Court it was ready with a roadmap to deposit the remaining amount of Rs 12,000 crore in the Sebi-Sahara account by December 2018 to be refunded to the investors. The group told a bench headed by Chief Justice T S Thakur that the road map has been shared with market regulator Sebi and amicus curiae and senior advocate Shekhar Naphade. The bench then continued with the interim bail and other arrangements granted to Sahara Group chief Subrata Roy till November 28. Earlier, the top court had said it had been "taken for a ride" by the Sahara group through its past conduct and had directed it to submit a roadmap to pay the balance amount of Rs 12,000 crore (Rs 120 billion) to Sebi, while extending the parole of Roy and others till October 24 on payment of Rs 200 crore (Rs 2 billion). Senior advocate Kapil Sibal, appearing for the group, told the bench, which also comprised Justices A R Dave and A K Sikri, that they have deposited Rs 200 crore with Sebi in pursuance to an earlier apex court direction. The bench said Sahara has to deposit another Rs 200 crore by November 28 so that the interim arrangement could continue. Sibal said the group was ready with Rs 15 crore (Rs 150 million) and the remaining amount of Rs 185 crore would be deposited by the next date of hearing. The court also allowed the group to re-auction certain properties in Ajmer, Firozabad, Vellore, Tiruchirappalli and Ujjain for which the bidding was at a much higher price. The bidding could not be taken to the logical conclusion at that time due to some legal impediments because of income tax issues. The group had, on Thursday, told the apex court that it would deposit Rs 200 crore with SEBI in pursuance of the earlier direction and had sought advancement of hearing in the case. 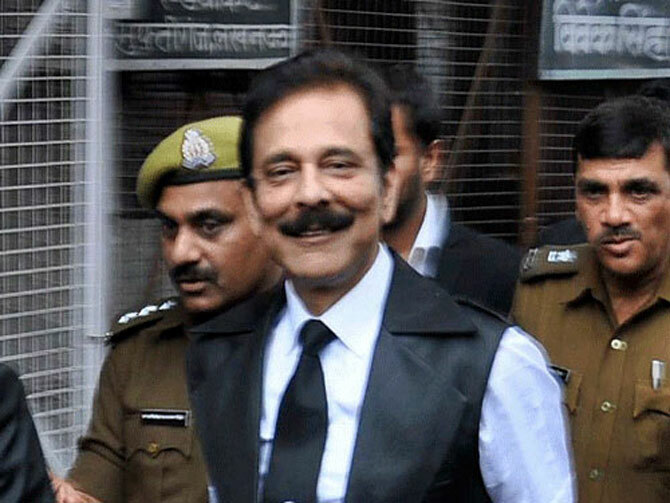 The apex court, on September 28, had asked Sahara to deposit another Rs 200 crore by October 24 while extending the interim order releasing Roy and two other directors on parole. It had said Sahara had not disclosed earlier that out of the list of 60 properties given to SEBI for sale, 47 were provisionally attached by Income Tax department. During the earlier hearing, senior advocate Arvind Datar, appearing for SEBI, had said that Sahara group was liable to pay Rs 37,000 crore (Rs 370 billion) with interest to SEBI, of which the principal amount payable was Rs 24,000 crore (Rs 240 billion). Sahara has paid Rs 10,918 crore (Rs 109.18 billion) out of Rs 24,029 crore (Rs 240.29 billion) raised from investors, he had said then. While extending the parole of Roy and two directors - Ashok Roy Choudhary and Ravi Shankar Dubey - till October 24, the bench had directed the group to deposit Rs 200 crore by then, failing which they will be committed to jail.